God, be merciful to us. Forgive us all, Lord, of our shortcomings. We don’t mean to stand here in this pulpit and let these people stand around walls, and their limbs a aching, and then just go away and say, “Well, that sounds very good.” Lord, we want to do something about it. We, we want You to search our hearts. If there is anything wrong, Lord, let us know now. Please don’t let us come to that hour, yonder, when it’s too late. Search me. Try me, Lord. Who did Brother Branham want to call after the service, because it was her birthday? Which of the following does Brother Branham NOT mention about Irenaeus? What color horse was the second horse rider riding on? And there went out another horse that was red: and power was given to him that sat thereon to take _______ from the earth. The antichrist is a Gentile. When the antichrist spirit became incarnate in a man, he was then _______ and received a throne. "Now watch. Satan’s duty is to _______ the Word of God, to wisdom’s _______." Who has to open every Seal? Israel will not be converted as a nation, but as a person. It is the same rider on the white and red horse. "And the _______, in the Bible, under a symbol, represents a power." What does the phrase “VICARIVS FILII DEI” mean that is written over the Vatican? If you take the Roman numbers of “VICARIVS FILII DEI” and add them together, what do you get? What do the two horns of the little animal that raised up like a lamb in Revelation 13 represent? What was Saint Patrick’s real name? Who was the white horse Rider of Revelation 19 crowned by? 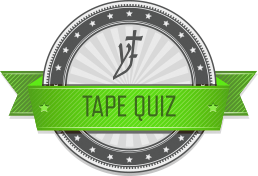 Here are the current quiz results for The Second Seal. Anyone taking the quiz after Thursday, February 28, 2019 will not have their score posted.